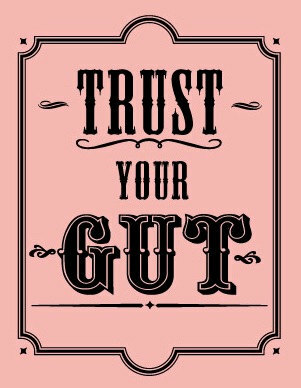 The most important lesson I’ve learned in life so far, is to trust your gut. My mother told me for years to listen to your intuition because it’s always right. I fought her constantly, saying I knew what was best not some stupid gut feeling. Boy was I wrong. The thing about gut feelings is they aren’t always the strongest. It’s usually your heart, mind or down south that put out the strongest feelings. They’re also the easiest to follow because those feelings are so passionate. From personal experience I’ve learned that your heart is the hardest to ignore. When it’s telling you to do something it’s nearly impossible to do the opposite. It feels like your whole body is driving you to do something, no matter how stupid that something may be. When it comes to the mind, that one is a bit more complicated. Your heart is usually the one telling you to do the crazy, passionate acts in life where as the mind is the logical one. It’s the one telling you to think things through. Look at all the different out comes and decide if the choice your about to make is really worth it. My mind has always been like this for me, my heart is telling me to just do it and not care but my mind thinks about the consequences. I usually end up following my heart which is probably really dumb in certain situations. As for down south…we all know what lust feels like. It’s extremely powerful and can change how people act. It’s almost impossible to ignore because hormones rush through your whole body amplifying all your sense and making everything feel so much better. I said your heart is the most powerful but I would also argue that lust is. Sometimes lust can be a beautiful thing but it can also be extremely dangerous and when those hormones are blinding your judgement it can be a hard thing to say no too. That is why I believe in the simplest form of all of this. Trust your gut. It takes a strong person to say no under different circumstances, especially as a teen with all the peer pressure your surrounded by daily.It’s scary, it really is. Trusting yourself is so important but it’s also so hard when people are constantly trying to get you to do and believe different things. I’ve been lucky enough to gain the ability to fully trust myself and my choices through leaving high school. Joining college early was the best thing I could have done for myself and it’s benefitted me in numerous ways. I now am able to say I truly trust myself and the decisions I make…no matter what part they come from.